An unpleasant combination of loud, often jarring, and discordant sounds: Brenda was from the city and thought that the farm animals with their loud vocal sounds made the most repulsive cacophonia that she had ever heard. A reference to the use of harsh and unpleasant sounds or vulgar language: The author was criticized for using some cacophonic language in his novel. Sometimes when people utter cocophonic words on TV, such expressions are obviously deleted before the listening audience is exposed to them. Descriptive of the unpleasantness of the sounds of certain words, phrases, and sentences: There are some people who have no regard for the feelings of other people as demonstrated by their cacophonical ways of talking. Someone who tends to use a combination of loud and often jarring words or sounds: When Jacob was delivering his political speech, a woman from the audience interrupted him with a critical comment and as a result, he lost his temper and suddenly became a cacophonist who yelled at her to sit down and to shut up! 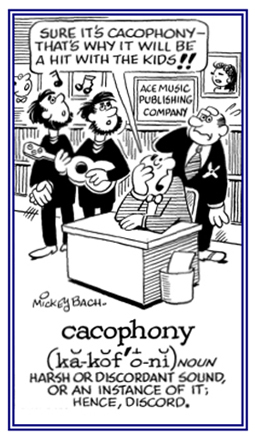 The members of the orchestra were a bunch of cacophonists producing a lot of racket as they were individually tuning their musical instruments before the conductor started rehearsing. The boy trying to play his violin, his dog, and the cat on the roof of the house next door; all illustrate a group of cacophonists. To make harsh or bad sounds: Using an untuned piano and a toy horn, Henry cacophonized while sitting on the balcony overlooking a peaceful lake, upsetting others who were in apartments nearby. 1. 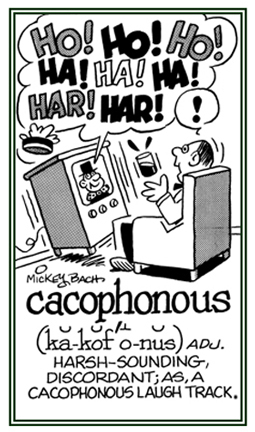 Having an overly loud or unpleasant sound: Tracy's cat is very sensitive to the more cacophonous sounds that she hears on the TV; especially, the boat whistles. 2. Sounding loud, jarring, and unpleasant: Cleo suddenly woke up to a cacophonous noise which she realized was the jack hammers starting to work early in the morning on the balcony repairs of the apartment building where she lives. © ALL rights are reserved. A reference to very loud sounds which are harsh and unpleasant: The cacophonously clamorous machines being used by the street workers, who were installing new sewer pipes, was very disturbing to nearby residents. 1. The quality of having bad sounds; the use of terrible-sounding words or phrases: The cacophony of noise from the street rose up and through the open windows in the tall office building. 2. The use of unpleasantly loud sounds in language; for example, for literary effects: The author of the new novel Marie is reading used many cacophonies in the text, capturing the realistic sounds of the birds in the jungle. 3. 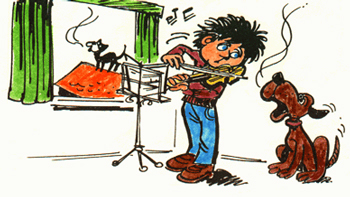 A discordant combination of dissonance: When Denise went to the students' concert, she was startled by the cacophony of the unharmonious presentations by the school's musicians. © ALL rights are reserved. 1. A type of instrument that produces music when operating with air pressure: The calliope was known as a steam organ, or a musical instrument consisting of a set of steam whistles that were activated by a keyboard. 2. Etymology: in classical mythology, Kalliope was the muse of heroic poetry. Her name came from calli-, "beautiful" + op, "voice" + the feminine ending -e; and is based on calliope + -phone, "sound". Showing page 3 out of 21 pages of 304 main-word entries or main-word-entry groups.